Received 15 September 2009; revised 10 October 2009; accepted 20 October 2009. 73% v 52%)) than the predictor in the previous study. treatment to the individual patient. often necessary for building robust predictors [6,7]. neoadjuvant chemotherapy for breast cancer patients. value, a sensitivity of 43%, and a specificity of 100%. 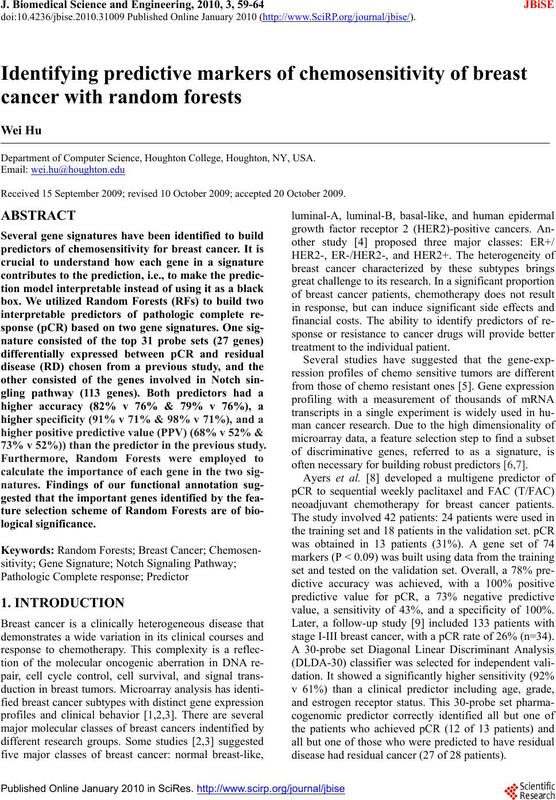 stage I-III breast cancer, with a pCR rate of 26% (n=34). disease had residual cancer (27 of 28 patients). , which was used as our first signature. pathway that has a key impact on human cancers. 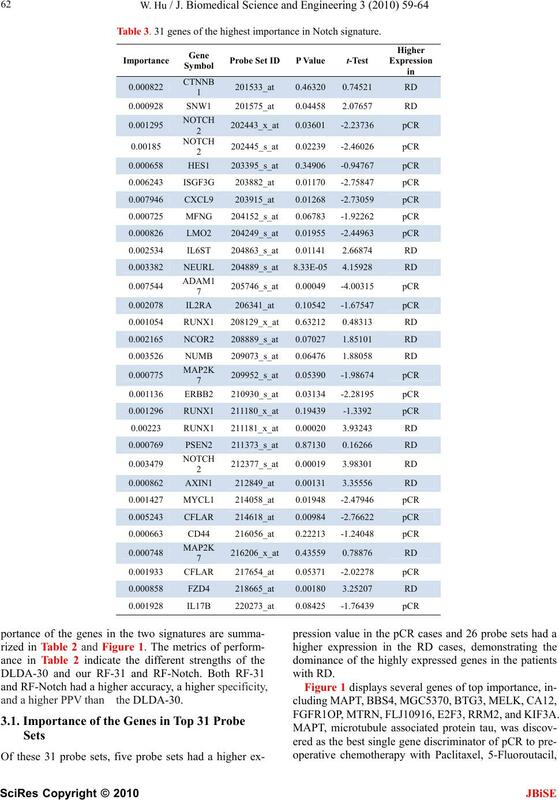 nature was these 113 genes as shown in Table 1.
was used to help select the top 31 probe sets in . 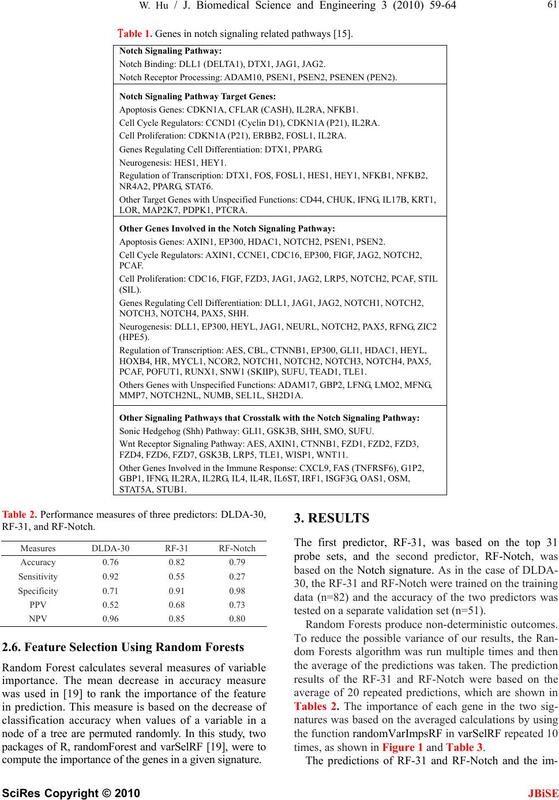 evaluate the performance of the classifier. Table 1. Genes in notch signaling related pathways . Notch Binding: DLL1 (DELTA1), DTX1, JAG1, JAG2. 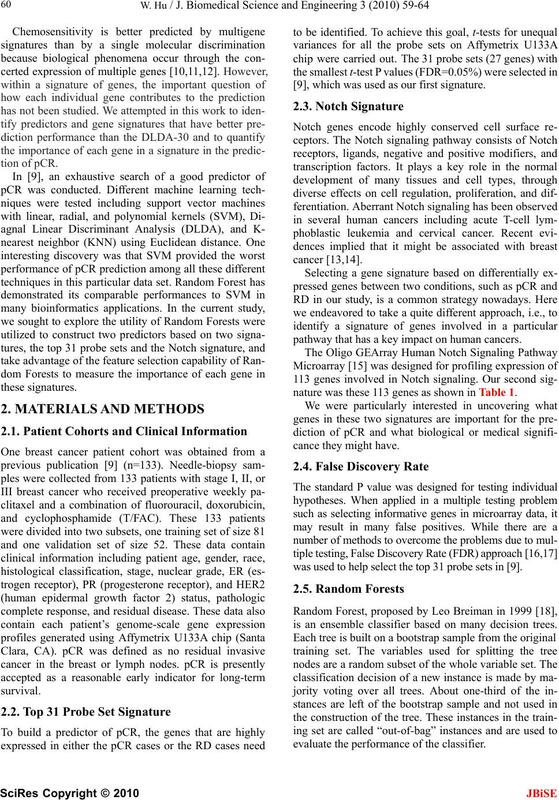 Notch Receptor Processing: ADAM10, PSEN1, PSEN2, PSENEN (PEN2). Apoptosis Genes: CDKN1A, CFLAR (CASH), IL2RA, NFKB1. Cell Cycle Regulators: CCND1 (Cyclin D1), CDKN1A (P21), IL2RA. Cell Proliferation: CDKN1A (P21), ERBB2, FOSL1, IL2RA. Genes Regulating Cell Differentiation: DTX1, PPARG. Apoptosis Genes: AXIN1, EP300, HDAC1, NOTCH2, PSEN1, PSEN2. PCAF, POFUT1, RUNX1, SNW1 (SKIIP), SUFU, TEAD1, TLE1. MMP7, NOTCH2NL, NUMB, SEL1L, SH2D1A. Sonic Hedgehog (Shh) Pathway: GLI1, GSK3B, SHH, SMO, SUFU. FZD4, FZD6, FZD7, GSK3B, LRP5, TLE1, WISP1, WNT11. compute the importance of the genes in a given signature. tested on a separate validation set (n=51). times, as shown in Figure 1 and Table 3. Table 3. 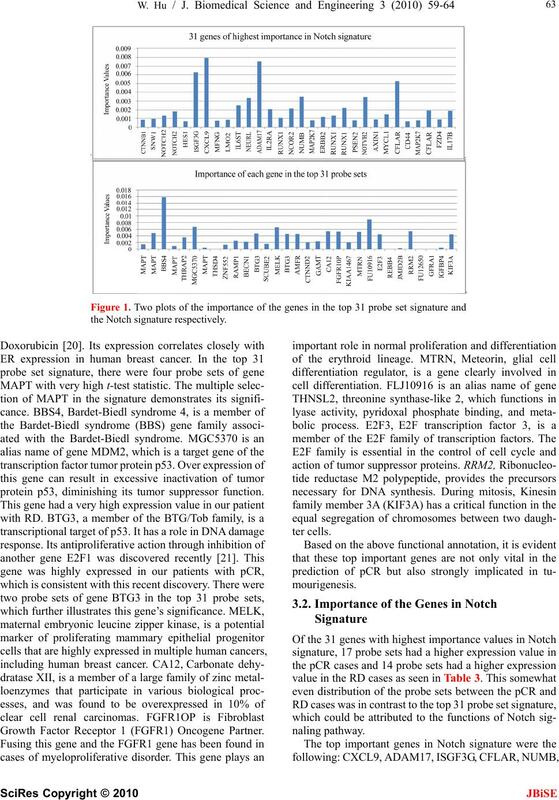 31 genes of the highest importance in Notch signature. and a higher PPV than the DLDA-30. FGFR1OP, MTRN, FLJ10916, E2F3, RRM2, and KIF3A. protein p53, diminishing its tumor suppressor function. Growth Factor Receptor 1 (FGFR1) Oncogene Partner. ble 1, we will not elaborate on them any further here. seven such genes in Notch signature. This was expected. signature genes displayed their significance. Forests are of biological significance. 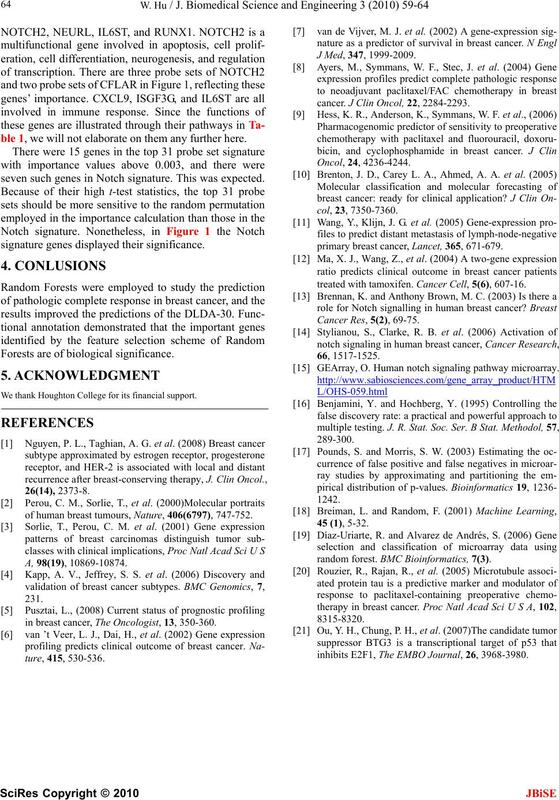 of human breast tumours, Nature, 406(6797), 747-752.
in breast cancer, The Oncologist, 13, 350-360.
cancer. J Clin Oncol, 22, 2284-2293.
primary breast cancer, Lancet, 365, 671-679.
treated with tamoxifen. Cancer Cell, 5(6), 607-16. GEArray, O. Human notch signaling pathway microarray. random forest. BMC Bioinformatics, 7(3). inhibits E2F1, The EMBO Journal, 26, 3968-3980.